“Chefs at Sea” – a must visit JRE gastro event! Jeunes Restaurateurs d’ Europe, an association which gathers 350 restaurants and 160 hotels, and more than 340 talented young chefs from all across Europe, has once again organized a special event for all of those who seek culinary perfection in every single bite. 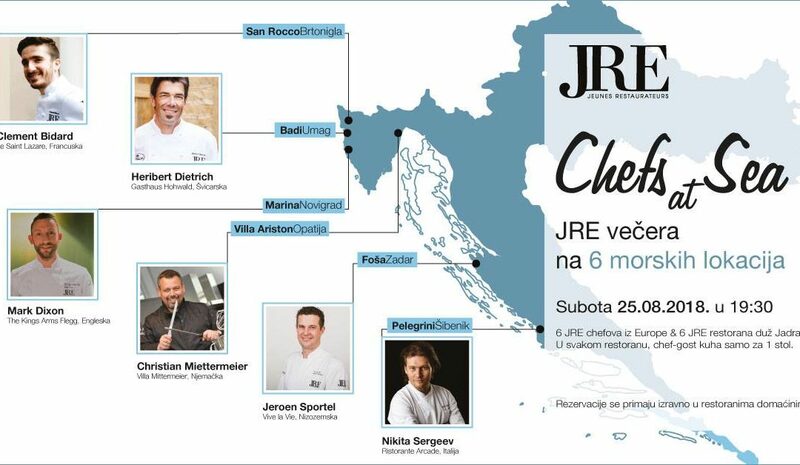 Chefs at Sea is a one-day event which will take place in 6 renowned restaurants located along the Adriatic coast, with every restaurant hosting one of the famous JRE chefs, including San Rocco heritage hotel & gourmet restaurant, a proud member of the JRE family. This offer includes a unique experience of having a JRE guest-chef cook delicious specialties for only one table, dedicating all his skills and creativity to satisfying your gastro appetites. On the 25th of August, the San Rocco restaurant will be hosting chef Clement Bidard from the Le Saint Lazare, France, who will certainly impress you with his exceptional culinary skills and philosophy. Relax in a comfortable setting, enjoy pleasant ambience and professional service, taste some of the amazing creations of chef Bidard and treat yourself and your company at the table with a private little gastro show. If there was ever a time to be excited about a gastro-event, that time is now. For more information and reservations feel free to contact us on +385 52 725 000 or via email at info@san-rocco.hr. See you at San Rocco’s!